Click image to see slide show (1 of 17 photos)As part of the 100th Anniversary of the Royal Canadian Navy, the Elgin Military Museum has obtained the HMCS Ojibwa, a cold war Oberon Class submarine, as part of a Museum naval heritage for the benefit of future generations. 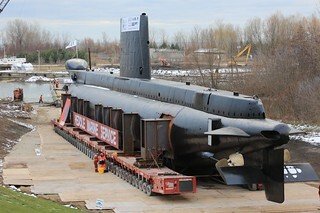 The Elgin Military Museum of Naval History will open in 2013, the one hundredth anniversary of the Canadian Submarine Service. The Airborne Regiment Association of Canada (ARAC) is asking for paratroopers and supporters to answer the “riggers call” in support of the planned project for the building of the Canadian Airborne Memorial Cairn in Edmonton, Alberta. In 2006, during a special ceremony, the Airborne Plaza and street names were dedicated to 1 Commando soldiers Perron and Berger who died in 1974 in the service of their country. For those unfamiliar with these names, 20-year-old Private Lionel Gilbert Perron and Private Joseph Jean Claude Berger, aged 21, were killed and another 30 Airborne soldiers were wounded during hostilities in Cyprus. Perron, who was killed on August 6, 1974, and Berger, who died a few weeks later on September 10, were the first combat casualties suffered by the Canadian Army since the Korean War; unfortunately, they would not be the last Canadian soldiers to die on operations in the 20th century. The Canadian Airborne Memorial Cairn will represent all Canadian Airborne paratroopers who have fallen throughout the world. This memorial will be the first of its kind, as it will not be erected on a Canadian military base but in the former Griesbach Barracks, where the Airborne Regiment was raised and where many soldiers served. The City of Edmonton and the Canada Lands Company are supporting the Canadian Airborne Memorial Cairn that is planned to be unveiled in June 2013. Bill Dickson and his “pathfinders” are in the lead to raise donations for the $65,000 dollars required to build this long overdue memorial. Details on the unveiling of the Canadian Airborne Memorial Cairn will be provided nearer the event. To be kept up to date on this project, please include an e-mail address with your donation. There is no doubt that this will be a national event that will have a significant presence for currently serving as well as retired military members. Your swift support will ensure that we will have a Canadian Airborne Memorial Cairn the Canadian public and all Canadian paratroopers can be proud of. ARAC is pleased to offer a special commemorative coin in support of the Canadian Airborne Memorial Cairn in the Perron/Berger Park in Edmonton, Alberta. The coin features the image of the new monument on the front of the coin with the symbols of Pegasus and the Canadian Parachute Corps Crest. The Canadian Parawings are featured on the back of the coin. The coin is plated in antique brass and is 42 mm in diameter with a thickness of 3 mm. It comes with a protective clear pouch and a descriptive card of authenticity. The coins have been donated by ARAC so that 100% of your donation will go towards this fundraising project. For more information, visit the ARAC website at www.airborneassociation.com. Here is a new program started in BC and now rolling out across Canada called the "Veteran's Transition Network". If you are in contact with Veterans with PTSD, or know someone who is, I would recommend passing this information along to them and recommend that they contact the "Veteran's Transition Network" to enroll in this very successful program. Over 90 percent of graduates have moved on to new career opportunities, becoming healthy, productive citizens. I am pleased to let you know that the proposed changes related to the elimination of duplication between Veterans Affairs Canada and the Department of National Defence were pre-published in the Canada Gazette, Part I on Saturday, October 13, 2012. The proposed new delivery model for Career Transition Services (CTS) will also be included, providing greater choice to Veterans or survivors for access. This launches a 30-day period for public comment. Information relating to the above mentioned changes and the proposed regulations are available on-line at the Canada Gazette Web site: http://www.gazette.gc.ca/rp-pr/p1/2012/2012-10-13/html/reg4-eng.html. Contact information for those who wish to comment can be found in the document. A letter from the Minister of Veterans Affairs, the Honourable Steven Blaney, commending our colleague Colonel (Retired) John Stuart, for his work devoting his time to compile the service and burial information of all Canadian Forces members who died while serving under the auspices of the United Nations. Our Association is forever grateful to Colonel Stuart for his participation and outstanding contribution in many aspects of our involvement with Canadian Forces Veterans and their families. We are extremely fortunate to have a gentleman of this high calibre within our ranks and the ranks of Canadian Forces Veterans. Colonel Stuart, “Thank you ever so much”. Billy Willbond,originally from the Gatineau Hills, and the Ottawa Valley, and the city of Ottawa, joined the Canadian Army at the age of 17 and trained at the Depot and served with the QOR of C in Calgary, Germany, Victoria and Cyprus and was ops sgt for the Cdn AB Regt in Edmonton 68-71 and later for the Special Service Force (SFF) 77-78 in Petawawa, prior to retirement from the Army. Afterwards, he worked as a jail guard and communications member for CSPD for 23 years. He is a China Specialist and was trained by the Army to speak Chinese. He is President and CEO of ICROSS CANADA, and Secretary of the Mark Isfeld Memorial Chapter of CAVUNP. He has been awarded the CSPS Municipal Long Service Police Commemorative Medal. He is a member of the QOR Assn, the PPCLI Assn, the Piklee retired WOs and Sr NCOs Club, DZ VI, a past president of the Victoria Numismatic Society, and a life member of the AIRBORNE Assn, and a life member of local XII the BC Federation of Peace Officers. Billy writes poetry, in his words not good poetry, but words with a message for helping our wounded etc. Billy is married to Lynne, nee Nimmo of Saanichton. Lynne and Billy have four girls all are married and they have provided the happy couple with nine grandchildren, seven boys and two girls. Major Murray Campbell Edwards joined the Army in the beginning dark days of WW2, was a Rfn, Cpl, Sgt in the QOR OF C – he was an instructor of young officers in England and was CFR’d and later served as a Platoon Commander and then Field Quartermaster during the bloody days of fighting during the Korean War. Serving with Colonel Big Jim Stone and the PPCLI, he wears the blue presidential citatation for brave actions won by him and his battalion in the heated heavy fighting days of the sometimes forgotten Korean War. Murray served on several Peacekeeping Missions and was the first Canadian Liaison Officer on Cyprus in 1964 when the war broke out between the Greeks and the Turks. He is a veteran of Palestine and Damascus. He was a Compay Commander with the PPCLI in Germany, was an active jumper leading a jump company in Calgary and he is a NATO vet –He was (Billy’s) Sgt Willbond’s boss at MARPAC HQ in the 70’s and in billy’s opinion he is a great old soldier. He is an officer and a gentleman. Widowed, he keeps busy as VPres of the Mark Isfeld Memorial Chapt of CAVUNJP and as ICROSS CANADA’s Director for Victoria BC. Murray is 93 years old this year. Murray’s wife Maury, liked and enjoyed billy’s wet canteen poetry and she called him the Canadian Soldier Poet. The name stuck. 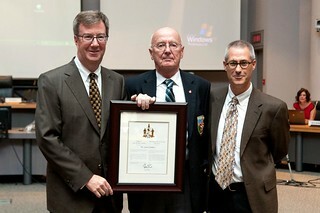 Mayor Jim Watson, with Knoxdale-Merivale Ward Councillor Keith Egli, today presented the Mayor’s City Builder Award to Gord Jenkins for his dedicated volunteer service in the community. Gord is Past President of the General Burns Community Association, which currently consists of 20 volunteers, each working to bring the community together. He is regarded as decisive, a great problem-solver and responsible for positively impacting the community by motivating the executive members of the General Burns Community Association to develop community-driven events. The General Burns Community Centre and its programs and services would not be so well-known and respected in the community without Gord’s efforts and energy. He has attracted volunteers with a diverse background in communications, finance, information technology, real estate and education and was responsible for a rededication ceremony by having a “General Burns Day” and for the creation of the www.generalburns.ca website. A Veteran will receive a response to their request on My VAC Account within one to five business days. If the Department is unable to provide a complete response within this timeframe, it will advise the Veteran of when they can expect to receive a response. If a Veteran has a question or concern related to My VAC Account they can call, toll free, 1-866-522-2122, e-mail information@vac-acc.gc.ca, or visit a VAC district office, integrated personnel support centre, or a Service Canada centre. Veterans can now receive customized information from VAC, on demand. My VAC Book is a new print-on-demand booklet that provides Veterans and their families with personalized information about VAC services and benefits available to them. Veterans can access it through veterans.gc.ca, where they are asked a short series of questions. For example, a Veteran of the Canadian Forces would be asked three questions specific to their service. Based on their answers, a customized 12-page booklet is created and is available electronically immediately with a hard copy arriving in the mail a few days later. With a streamlined centralized mail process, Veterans will no longer have to worry about where to send their mail. Most incoming mail to the Department will be sent to Matane, Quebec by 2014, making it easier for Veterans to send their mail where it needs to be. The consolidation of departmental addresses will happen in phases. VAC is partnering with Public Works Government Services Canada (PWGSC) to help centralize the mail process. PWGSC’s Document Imaging Services in Matane, Quebec allows departments to modernize and green their operations by replacing paper copies with digital information and to improve their client service by having electronic access to information. Because of this modernization, VAC employees are now able to process the same information simultaneously. Veterans will not be required to resubmit documentation and this centralization will contribute to faster decision-making and turnaround times for Veterans and their families. OTTAWA – The Royal Canadian Legion will build a “Virtual Wall of Honour and Remembrance” to honour all deceased veterans. The appearance of the “Virtual Wall” will coincide with the National Remembrance Day Ceremony, organized by the Legion on behalf of and for all Canadians. It will be displayed on the large video screens prior to the start of the actual ceremony on November 11, 2012 and those thereafter. Rededication Ceremony for Hill 70 L-R Hon. Steven Blaney Minister of Veterans Affairs; Doug Brunton VP Regions; John Coulombe National Executive and President of Unit #3 Ottawa/Gatineau; Mr.Guy Lauzon M.P.Stormont,Dundas and South Glengarry;John Pickard National Treasurer. 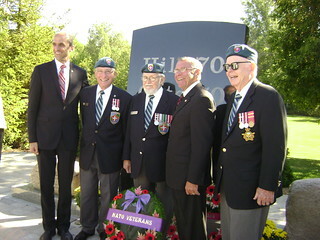 MOUNTAIN, ON, Sept. 16, 2012 /CNW/ - The Honourable Steven Blaney, Minister of Veterans Affairs, and Guy Lauzon, Member of Parliament for Stormont-Dundas-South Glengarry, today attended the Battle of Hill 70 Memorial rededication ceremony in Mountain, Ontario. "Our Government is committed to honouring Canada's Veterans and the brave men and women in uniform who continue to serve today," said Minister Blaney. "I am very proud to be here today to rededicate this newly restored monument. I commend the Township of North Dundas and the Mountain and District Lions Club for their hard work and dedication in ensuring that the contributions and sacrifices of the men and women who served in the Battle of Hill 70 are never forgotten." The rededication service consisted of speeches by special guests, the dedication of the monument and a wreath-laying ceremony, followed by a reception. "This special monument commemorates those service men and women who served and lost their lives in the Battle of Hill 70," said MP Lauzon. "Cenotaphs and monuments across our country are powerful reminders of the sacrifices made by our nation's truest heroes." The Mountain and District Lions Club has received Government of Canada funding of $38,933 through Veterans Affairs Canada's Community War Memorial Program, to assist with the major addition to the Battle of Hill 70 Memorial in the community of Mountain, Ontario. The project included the mounting of the two existing boulders on newly constructed cement bases; the installation of a new granite memorial between the mounted boulders; a walkway, a ramp and a surround pad constructed of pavers to improve accessibility to the site; the replacement of the existing flagpoles; and a new story board, highlighting the history of the Battle of Hill 70. The Township of North Dundas, in partnership with the Mountain and District Lions Club, will receive up to $5,000 under the Community Engagement Partnership Fund in support of the dedication ceremony. The Battle of Hill 70 has been called the forgotten Battle of the First World War of 1914 – 1918. Unlike famous battles in which Canadian soldiers took part, such as Vimy Ridge and Passchendale, no monument has ever been erected to remember what happened there. Only in the community of Mountain Ontario is there a memorial expressly dedicated to this important Canadian Victory. In the summer of 1917, Canadian General Sir Arthur Curries was promoted and made the General Officer Commanding of the Canadian Corps of the Canadian Expeditionary Force. For the first time and for the remainder of the war all four divisions of the Canadian Corps would be under Canadian Command. On July 7, 1917, the British High Command ordered General Currie and the Canadian Corps to capture the French city of Lens from its German occupiers. Seeing that the city was heavily fortified and easily defended, General Currie proposed that the Canadians instead storm Hill 70, the higher ground north of Lens. Beginning on August 1, 1917, the Canadian artillery bombarded the German trenches and defences on and in the vicinity of Hill 70. The artillery for the first time aided through real-time observation by radio-equipped aircraft of the Royal Flying Corps targeted the German defensive positions and gun batteries for two weeks. Despite heavy enemy artillery fire, including recently invented mustard gas shells, the Canadians Consolidated their gains and awaited the German counterattacks. Over the next four days and nights, the Germans would launch attack after attack to try to push the Canadians off Hill 70. None succeeded as the Canadians tenaciously defended the Hill, despite the sweltering summer heat wave, the clouds of poison gas, the ceaseless artillery shelling and the murderous machine gun fire sweeping the battlefield. Ammunition and water ran low and fighting often was hand-to-hand. Casualties were heavy on both sides but the Canadians never relented. By the end of August 18, the Germans had been completely defeated. No fewer than 21 counterattacks had been fought off. The victory cemented the reputation of the Canadian soldiers as being elite “shock troops” who were the best Allied troops to fight in the war. The cost was high. The Canadian Corps suffered 5,843 casualties during the Battle of Hill 70, including 1,505 killed, 4,297 wounded and 41 taken prisoner. In all the Corps suffered 8,677 during the fighting at Lens between August 15 and 25, 1917. Negotiator Appointed to Service Income Security Insurance Plan Class Action Suit OTTAWA, ONTARIO--(Marketwire - July 31, 2012) - The Government of Canada today announced the appointment of Professor Stephen J. Toope, President and Vice-Chancellor of the University of British Columbia (UBC), as federal representative in negotiations to resolve the Manuge class action, regarding the long term disability benefits to former members of the Canadian Forces (CF). "The well-being of both our serving and retired members is important for our government," said the Honourable Peter MacKay, Minister of National Defence. "This appointment further underlines our intent to work towards a positive resolution in this matter." Prior to joining UBC, Professor Toope was President of the Pierre Elliott Trudeau Foundation, a position he held from 2002 to 2006. From 1994 to 1999, Professor Toope served as the dean of McGill University's Faculty of Law. Previously, he served as Law Clerk to the Right Honourable Chief Justice Dickson of the Supreme Court of Canada from 1986 to 1987. He continues to conduct research on many aspects of international law and is currently working on issues of human rights and culture, and the origins of international obligation in international society. If a settlement of the class action is reached between the parties, it will need to be approved by the Federal Court. On July 24th a BBQ was held at Branch 212 of the RCL in Kemptville attended by 46 members and guests including our Patron General Paul Manson and wife Marg, a native of Kemptville, Wing Commander Russell Page and wife Lisa as well as the German Military Attaché LtCol Kay Kuhlen. After some brief introductory remarks and Grace by O/G President John Coulombe and a welcome from John Capes on behalf of the Legion, we all sat down to fine feed of Strip loin steaks cooked to order with baked potatoes, mushrooms, onions and coleslaw. A choice of fruit pies was available for dessert. All in all it was a very successful and enjoyable event. Special thanks were extended to John Coulombe, Doug Brunton and wife Catherine, Ken Richardson for organizing the event. At the end of the meal all kitchen and bar staff were called out for a well deserved THANK YOU. Written by renowned Canadian honours historian Christopher McCreery, MVO and produced by the Directorate of Honours and Recognition, this special historical project was undertaken to commemorate the 60th anniversary of the creation of the CD by King George VI. This book highlights the long history of this decoration and pays tribute to the extraordinary men and women of Her Majesty's Canadian Forces who have earned this honour and wear it with pride and distinction. Produced by the Directorate of Honours and Recognition, The Order of Military Merit was commissioned to commemorate the 40th anniversary of the foundation of this Order by Her Majesty The Queen on 1 July 1972. This work by renowned Canadian honours historian Christopher McCreery is the first to examine the origins and development of the Order. This book highlights the history of this honour and pays tribute to the extraordinary men and women of Her Majesty’s Canadian Forces who have earned it and wear its insignia with pride and distinction. The publication also includes a complete register of all members ever appointed to the Order. It will be distributed throughout the CF through the CF Publication Depot. There will be a book signing in the VIP Room adjacent to the NDHQ main cafeteria on Friday 8 June 2012, from 1400 to 1600, where the author will be available to sign your copy. Copies will be available, free of charge, on site. During that same day, a small exhibit related to the Order will be in place in that same location from 1000 to 1600. In order to enhance the visibility of the Order and increase the feeling of fellowship among its members, both serving and retired, a line of promotional items is also being launched. They include a limited edition and numbered commemorative plate, similar to that which was made for the Order of Canada in 1979, cufflinks, a broach, a tie and scarf and other similar items. The official supplier will have a booth in the VIP Room next to the NDHQ main cafeteria on 8 June from 1000 to 1600. These items may also be purchased from the official supplier on-line, at their new ORMM kit shop at www.guthriewoods.com/omm , 5% of the wholesale price of the items sold will be donated to the Military Families Fund. These items make suitable gifts from family, colleagues and friends on the occasion of an admission or promotion in the Order or upon the retirement of a member of the Order. While anyone may purchase the items, the wearable items may only be worn by members of the Order. Hi everyone. I'm sending this out because the Last Post Fund needs some help! If you can, please send this out to your military contact lists, friends etc., so that this gets wide distribution and the LPF can get the financial help they need, so that they can in turn help our veterans one last time. Let's see what we can all do as Canadians to honour those veterans that stood up for us and need the Last Post Fund to give them the dignity each one of them deserves. 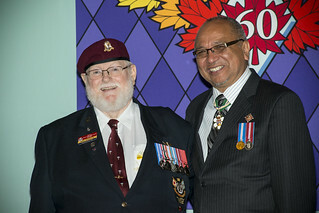 Montreal, 18 April 2012 – The Last Post Fund is embarking on a national fundraising campaign, entitled In Memory of our Veterans, which will be chaired by Major General (Ret’d) Lewis MacKenzie. The target for the first year of this fundraising endeavour is $3,000,000. Funds are needed to facilitate the dignified burial of Veterans in need who are not eligible for the federal government’s Funeral and Burial Program. Only a few modern-day Veterans are eligible for this Program, despite the urging for more than a decade by veterans organizations to extend eligibility to all Veterans, be they traditional or modern-day. “Believe it or not, said MGen MacKenzie, there have been Canadian Forces’ Veterans who, at the time of their death, did not have the financial means to receive a dignified funeral but did not meet the eligibility criteria of the Canadian government Funeral and Burial Program. Therefore the Last Post Fund has had to use donation funds to meet the specific needs of their family or estate”. Since the beginning of 2012, three such cases were brought to the attention of the Last Post Fund who provided financial assistance to the families of deceased Veterans. Funds are needed to support the Last Post Fund’s Unmarked Grave Program, whose objective is to provide a permanent military-style marker for eligible Veterans who lie in unmarked graves. According to Veterans Affairs Canada, there are between 20,000 and 30,000 such unmarked Veterans graves throughout the country. Funds are needed to support to the Last Post Fund National Field of Honour, a private non-profit military cemetery operating through donations from the public. Located in Pointe-Claire, Québec, this National Historic Site is the final resting place for more than 20,000 Veterans and close family members. They originate from all Canadian provinces but also from 41 countries around the globe. Infrastructure requirements include renovation of the Visitors’ Centre, land acquisition for earth burials, repair of roadways, and replacement of maintenance equipment. Funds are also needed to sustain the perpetual care fund, since interest rates have fallen while costs are constantly increasing. These Last Post Fund programs and activities aim at honouring the memory of the thousands of Canadian men and women who served our country, while defending our values of freedom and democracy. Donations can be made on line by visiting the Last Post Fund Website: www.lastpostfund.ca or by calling at 1 (800) 465-7113. Please be advised I just received a call from Benjamin Woodman, Minister of VAC Office, that the Minister will today, sign the papers effectively transferring the Veterans Hospital in St Anne’s to the Province of Quebec. Apparently at or about 1430 hrs today (I gather Ontario time) there will be a press release and as soon as I get it I will distribute it around. I understand that presently there are 380 patients (Veterans) in residence at this hospital. This spring, Veterans Affairs Canada will be conducting two different focus groups with Canadian Forces Veterans to learn more about their views and opinions. We would appreciate your support in recruiting potential participants in this valuable research. By promoting this initiative within your membership, you will be assisting VAC in receiving valuable feedback to ensure the increased effectiveness of the programs and services it provides. Participation in these focus groups is strictly voluntary. The decision to take part will in no way affect any dealings that Veterans currently have or might have in the future with Veterans Affairs Canada. The research will be conducted by two independent research firms, Harris/Decima and Phase 5 - both well qualified, third party professional research firms that are currently on the Government of Canada standing offer list for public opinion research. All opinions expressed will remain anonymous and views will be grouped together to ensure no particular individual can be identified. All information collected will be strictly confidential and used for research purposes only, in accordance with laws designed to protect your privacy. Recruitment for potential participants in these focus groups will be taking place through the VAC Web site until May 4, 2012 - http://www.veterans.gc.ca/eng/information-canadian-forces/opt-in. We invite you to promote these research opportunities with your organizations. If you have any questions, please do not hesitate to contact Colleen Soltermann at (902) 566-8912. As part of the regular evaluation of Veterans Affairs Canada’s programs and services, the Department conducts research independently or with the assistance of a professional research firm. This includes public opinion research, such as the focus group testing, we are currently undertaking. This type of research provides key information in the delivery of our programs and services and helps determine their effectiveness. Over the next three years, as part of VAC’s Transformation Agenda, opinion research will be conducted through a combination of focus group testing and surveys with Canadians and Veterans, still-serving members and families. This data will be used to monitor trends and levels of understanding and awareness of the VAC’s programs and services. The results will be used as a performance measurement tool to help inform future communications and outreach programming. The e-mail that I sent yesterday refers to the recruitment underway of Canadian Forces Veterans who have been released since 2002, as well as still-serving members and families to participate in upcoming focus groups. These focus groups, along with other research, will allow VAC to learn more about their views and opinions. There are two distinct focus group projects being carried out with different selection criteria, one for programs and services for CF Veterans and one for communications products. Participants for each are being screened through the suppliers’ web sites. The information VAC will gather through the public opinion research underway will complement the discussions that we have on an ongoing basis with Veterans’ organizations. Good day everyone, hope this note finds you all well, I know you will be busy. I have all the pleasure of being invited to the showing of this documentary, a week or so ago. There were three member present, in fact, if you get a chance, and I hope you do, you will identify Constable Beehan appear at all content shifts within the film. The film was funded by many but the Provincial and Federal Governments were kind. This real life experience will give you an idea of some of the hurdles you may encounter as you advance in your service with a number of venues i.e., politicians, Veterans' Affairs Canada, issues concerning treatment and entitlement as a result of serving Canada. A special request to the CO/SRR's, The Royal United Services Institute, Veterans Emergency Transition Services (V.E.T.S. ), Canadian Association of Veterans in United Nations Peacekeeping, Royal Canadian Legion, and the RCMP Veterans Association of Nova Scotia to distribute this notice to those within the viewing premiter of the enclosed media service below. The viewing of it is a personal choice the learning opportunity is price-less. If there is someone within you would like to be put in touch with and you have no luck, let me know and I will provide you the contacts you need. Thank you for your time and patience, Murray. BROKEN SOLDIERS on EastLink TV - Promo from Dale Stevens on Vimeo. A television production company located in Cole Harbour has produced a one hour documentary that explores the lives of Canada's disabled and injured military veterans. Broken Soldiers, presented by Clerisy Entertainment and produced and directed by Dale Stevens, will be broadcast across Canada to all Eastlink customers every Sunday night in April at 9 p.m.
"This documentary uncovers what many Canadians know about only in bits and pieces," said Stevens. "This is all about medically released, disabled veterans and the challenges they have. This gives them a voice." 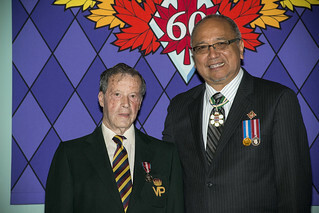 Stevens first became aware of the plight of the veterans when he was approached by an Eastern Shore man, Dennis Manuge, who in 2007 launched a class action lawsuit against the federal government on behalf of 6,500 disabled veterans who had been affected by the disability benefit clawback. Manuge's story affected Stevens deeply. "I wanted to be a catalyst to clear something up," he said. "I have so much compassion for veterans. Anyone who puts on the uniform and serves our country deserves to be heard, and that is what this film does, it gives them a voice." Manuge is not the only veteran to be showcased in the film. Stevens' film also highlights the struggle of those veterans challenged by PTSD and homelessness. Injustices and misunderstandings that affect thousands of people across the country. "When you sit down and talk with these people, as I did, you realize that they all have problems with Veterans Affairs," said Stevens. "This film isn't about a rant, and it isn't a partisan problem, it is about the mismanagement of the past 50 years." Stevens is a native of Musquodoboit Harbour and in 2009 completed producing, writing and directing his first television series called Ghost Cases. The 13-episode ghost hunting series is currently being distributed internationally. While vice president of Arcadia Entertainment from 2005 to 2008, he worked on many television productions, including Chasing WildHorses, Buried at Sea, Dreamwrecks, Freemasonry Revealed, That News Show and Go Deep. Broken Soldiers makes no attempt to make excuses for the veterans. Each person is honest and direct in their interpretation of their lives after being discharged from the military. And each veteran recommends the military as a career, it is in the moment that they are released that the problems begin. "But what I am doing, through the film, is showing how these guys are not milking the system," said Stevens. "I am showing how the only way to get rid of ignorance is to push it into the light." The film takes a complex problem and makes it easily digestible. Stevens says if there is hope for change in a mismanaged system then it will come from the veterans themselves. An organization called Veterans Emergency Transition Services, run by local veteran Jim Lowther, is responsible for helping get at least 13 veterans get off the streets of Halifax in the last year. In the film, Stevens highlights the group and their success in getting Rob Dobson off the streets and onto a more positive path in life. Dobson says there should be an army of people patrolling the streets looking for veterans who have fallen though the cracks. "I just hope this film gives people an opinion," said Stevens. " It is about sadness, hope, injustice and strength and the positive that has come out of the attention given to the brotherhood of veterans found across this country." Broken Soldiers will be broadcast every Sunday night in April at 9 pm on Eastlink television. We are being asked to support this motion. While most private members bills fail to become law, Bill C-354, the Defence of Canada Medal Act is one that AFP/AAC is encouraging members to support. Introduced by Carol Hughs, MP for Algoma-Manatoulin-Kapuskasing, the bill seeks to establish an award formally honouring individuals who defended Canada from within Canada to ensure the survival of the country's people and democratic way of life during the Cold War. It would retroactively recognize those who served in the regular and reserve forces, police forces, emergency measures organizations, as well as civil organizations, such as St. Johns Ambulance, all of whom were focused on protecting Canada from the threat posed by the countries behind the Iron Curtain. The Bill represents the hard work and vision of a constituent, says Hughs. "C-354 was brought to me as a complete proposal by Elliott Lake resident Ulrich Krings shortly after I was first elected. I introduced it in the 40th and 41st parliaments where it garnered interest from all over Canada as people recognize relatives, friends and others who would be suitable candidates for such an honour." Many people want to give something back to all those who worked to keep us safe and prepared in case of an attack on Canadian soil, she explains. "There is a great desire from people who have contacted me to recognize the contributions made by Canadians from all walks of life during the Cold War. Hopefully the Defence of Canada Medal proposal can help focus those desires into a tool that will allow Canada to do that." The Cold War lasted from 1946 when Sir Winston Churchill made his famous speech proclaiming " an iron curtain has descended across the continent," until the fall of the Berlin Wall in November 1989. This period in the history of Canada, and the world, shaped the lives of the many men and women who served the nation as a member of the Armed Forces and other organizations. The medal would be awarded by the Governor in Council to any Canadian citizen or permanent resident with a minimum cumulative period of three years of service in one or more of the specified organizations during the period commencing 1 June 1946 and ending on 30 November 1989. Anyone who would like to offer their support for this initiative can let their MP and others know about Bill C-354, says Hughs. "They can also write the Prime Minister, the Minister of Defence, and even the Governor General about the idea. I would certainly be glad to be copied on those messages and will use the information to keep interested parties in the loop when developments on the proposal occur." Contact your MP today to express your support for the private members bill. A list of contact details for all MP's is located on our website at www.afpaac.ca. Canada’s biggest publisher of history and heritage titles, is publishing Commemorative Medals of the Queen’s Reign in Canada, 1952-2012, by Christopher McCreery, to release in May 2012. We would be pleased to offer your organisation a special pre-publication price for the book, which would be a thoughtful companion to the Queen Elizabeth II Diamond Jubilee Medal. The note below has information on the book and order information; the books will be shipped out as soon as they are available. Please contact me if you have any queries. On the 8th of March, the Veteran's Ombudsman Guy Parent met with the Standing Committee on Veterans Affairs. Here are the "Blues" of this and related discussions. Blues is the term given to the initial record. This term is discarded once the minutes have been approved, which will happen in about a week of two. Guy and his group are doing wonderful work in support of our Veterans. I encourage you to read the attachment for some insight into some of the major issues that the Veteran community is facing with respect to improving service for those that deserve it. How could two departments of the federal government be so diametrically opposed? I ask this question because there are two economic support programs for our veterans in play here. Before October 2011 the New Veterans Charter (NVC) and the Service Person’s’ Income Security Insurance Plan (SISIP) provided for 75% of a Canadian Forces member’s salary at release – the two programs were exactly the same. Injured members were on one or the other. Last year, in response to appeals from veterans’ groups, such as The Royal Canadian Legion, the federal government announced they would increase the benefit to ensure basic needs as shelter, food, clothing, etc., could be met. 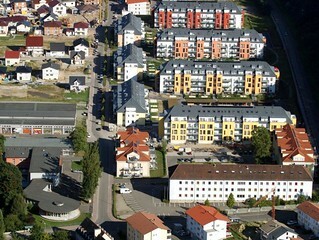 VAC implemented the increased amount to the ELB program on 3 October 2011. The Department of National Defence (DND)/CF did not. Therefore, there is now a huge inequity! Through no fault of their own we have some veterans who have been injured attributable to their military service being paid $40,000 per year and some at less than $20,000. This is an unacceptable situation and needs to be fixed now. We have given DND and the CF ample time to fix this inequity but there has been no commitment to date. Now, with the federal government deficit reduction a certainty, The Royal Canadian Legion is looking for a commitment and a firm date. Young men and women today join the CF for a rewarding career. To have it cut short by a debilitating injury is hard enough, however, the loss of a suitable income should they be unable to work again is a two-fold burden that they should not have to bear. Patricia (Pat) Varga is the Dominion President of The Royal Canadian Legion. In the weeks before I departed a reunified Germany in 1993, I traveled, as a member of 4 Canadian Mechanized Brigade, to Soest for a final freedom of the city parade. The hundred-man guard was mostly drawn from 8th Canadian Hussars (Princess Louise’s). On the way we stopped at a Canadian military cemetery at Werl. This was not a Second World War-era cemetery. These were 120+ Canadian soldiers who had been killed on exercise or succumbed to medical complications. Some probably died by misadventure. But all died in West Germany as part of a force designed to deter the Soviet Union and its allies from invading western Europe. Those large-scale annual exercises had a deterrent function in the larger scheme of things. The combination of presence and readiness contributed to averting a war of that would have escalated to global nuclear weapons use quite rapidly. Similarly, in my travels, I have seen many ‘gate guardians’ at current and former RCAF bases in Canada. Usually there is a CF-101 Voo Doo and a CF-100 Canuck. In no case are there detailed explanations as to why those aircraft existed and what they did, beyond technical data depicted on brass plates. How may pilots, or pilots-in-training lost their lives on operational or training flights related to NORAD operations doing exactly the same things that their comrades in arms in West Germany were doing: providing a presence and a deterrent function? In many cases that I am aware of, our interceptor forces did everything except fire live against Soviet bombers and recce aircraft on the edges of our airspace. And I could say similar things about anti-submarine operations conducted by the RCN and its successor organization. We knew it was ‘peacetime’ but we also knew in those days that international crises could escalate: and they nearly did in 1948, 1949, 1950, 1956, 1958, 1961, 1962, 1968, 1983 and so on. People joining the Canadian Forces in those days understood that they really weren’t joining a ‘peacetime’ armed forces and that a certain higher level of readiness was demanded in Europe and in North America. There is a UN peacekeeping monument in Ottawa, but there is no monument to the Canadians who served in the long Cold War. Arguably they contributed more to ‘world peace’ than thin-blue line UN peacekeeping did and there were a lot more of them. The educational system writes Cold War veterans out of history and I defy you to find any serious discussion of Canada’s NATO and NORAD forces for the period 1951-1993 in any Canadian history textbook at the high school level. The products of that system will be the people passing bureaucratic judgment on VAC pensions, funding for memorials, and what constitutes Canadian history. NATO Veterans of Canada now gives a voice to those who served in a unique arena which had nuclear Armageddon as a possible end-game. This Sunday March 11 at 4:00pm tune into CPAC for Dale Goldhawk live to see a panel speaking and taking calls on how veterans are treated by the government. Sean Bruyea, retired intelligence officer and veterans' activist. Wayne Mac Culloch, CD, B.Eng., M.Sc., P.Eng.